Many of us don’t know that acne can affect people of all ages. Though we mainly associate blackheads, whiteheads, and open pores with teens, anyone from a baby to a more mature adult can be prone to breakouts because anyone can have oily skin. Our sebaceous glands naturally produce sebum, which lubricates the skin and keeps it hydrated. Yet, like too much of any good thing, excess sebum isn’t ideal. It can lead to shiny skin and breakouts all over the body. Luckily, though, we can avoid major breakouts by cleansing our skin regularly and making a few simple lifestyle changes. Doesn’t sound too bad, right? Here’s how to clean acne prone skin and see real results. This one’s for all the DIY fans out there. Even if Pinterest skin care hacks aren’t your thing, making the perfect face mask for your acne-prone skin is easier than you think. The best part is, you might already have what you need in your kitchen! Foods like avocado, eggs, honey, or bananas can be whisked together to create gentle, hydrating masks that leave your skin feeling softer after 20 minutes. Honey is a natural acne remedy and holds many cleansing properties. You can apply this directly onto the skin like you would with any normal cleanser. We all want to cover up our acne as soon as we break out. It’s normal. But, applying foundation directly onto your breakouts can actually irritate the skin and clog your pores, making your acne even worse. We suggest giving your skin a rest. Take a day off from using foundation or try a tinted moisturizer, which hydrates your skin and gives it a nice glow. Is this extra step really necessary in your skin care routine? We’d say so! Toners cleanse the skin, shrink pores, and remove dust and dirt that have taken up residence on your face during the day. If you prefer natural products, a great substitute to toner is rose water. A quick spritz of rose water onto acne-prone skin is not only refreshing, but also helps keep your pores dirt-free. Get a full eight hours of beauty rest! A good amount of sleep is great for your entire body. Just a few extra hours of sleep significantly lowers stress levels and makes your skin dewy. Who doesn’t want a natural glow? To get a full night’s rest, try sleeping with your phone turned off so any flashing lights or notifications won’t disturb you (we’re guilty of this, too!). The light from your phone might keep your mind awake by simulating sunlight. We love our treats as much as the next girl, but too many sweets can cause our bodies to produce an excess amount of insulin. Excess insulin, like excess sebum, often leads to clogged pores. We recommend a well-balanced diet by adding more whole grains and vegetables, and cutting back on pasta, white rice, bread, and sugar to minimize breakouts. Don’t forget to drink lots of water to stay hydrated and flush out toxins and impurities in the skin. 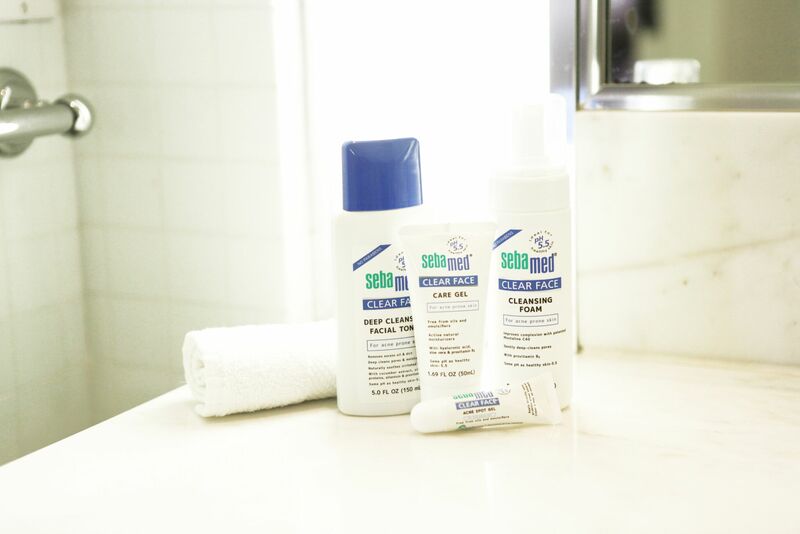 Sebamed offers great solutions to help keep your skin acne-free! Check out our Clear Face line of products here. time locating it but, I’d like to send you an email. site and I look forward to seeing it develop over time. Hi there! We love hearing new ideas and topics that our readers would like covered. We’ll have someone in our marketing team reach out to you. And thank you so much for reading our articles and giving us such kind feedback. Hopefully one of our future posts will be something you’ve inspired! 🙂 Best wishes.